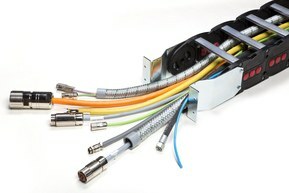 Cable chains made of nylon or steel with highly flexible cables, cable protection conduits, hydraulic hoses or pneumatic hoses with no termination such as connectors or fittings. 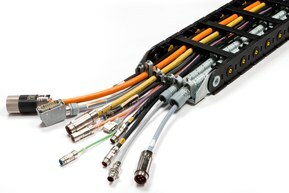 Cable chains made of nylon or steel with highly flexible cables, cable protection conduits, hydraulic hoses or pneumatic hoses including termination (connectors, fittings). 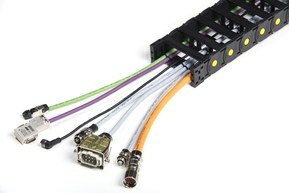 Complete cable chain unit with system guarantee. 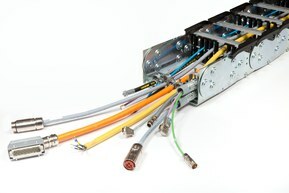 Cable chains made of nylon or steel with highly flexible cables, cable protection conduits, hydraulic hoses or pneumatic hoses including termination (connectors, fittings) and functional units such as towing arms or supporting structures. Cable chains made from nylon (polyamide PA 6) for self-supporting or sliding applications or applications with circular motion. Open or fully closed design available. Cable chains made of steel (galvanized steel or stainless steel) for standard self-supporting, sliding applications or applications with circular motion. Ideal for more demanding environments (e.g. extremely low or high temperatures, hot chips, etc.). 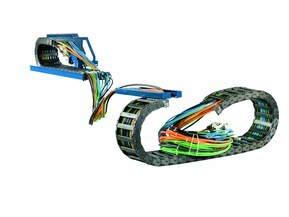 Cable chains made of combined materials (e.g. 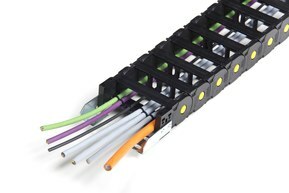 nylon sidebands with aluminum frames or aluminum covers, etc.) for unique extraordinary requirements. Combination of nylon, aluminum or steel parts capable of withstanding harsh environment and increases chain lifetime while maintaining optimal cost.